There are two things I love about winter….and since I don’t ski that only leaves warm puddings and fruit crumbles (crisps). There’s not much interest in my house for anything like this so, unless I am going to eat the lot I need some helpers ( visitors, neighbours) or some excuse to make them. It is unfortunate that I have a great weakness for crumbles and I can happily eat a pudding or some crumble for breakfast with a spoonful of yoghurt. I know that this is probably not something I should admit in these times when everyone no longer eats flour and sugar and butter but ….hey I must be old fashioned! You add the chocolate to these puddings in a rather novel way; by adding it in squares to the batter. Be sure to use a nice dark chocolate or your puddings will be too sweet. 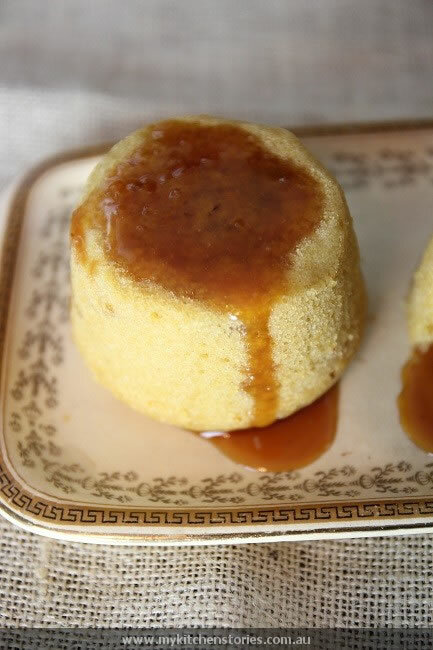 Give this caramel sauce a go. It is a lovely bittersweet one that works extra well with chocolate. 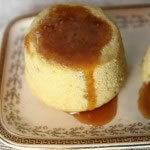 If you would prefer a creamier caramel sauce thats spoiled together use the one from the Frozen Banoffee Cake post. Put 2 large tablespoons into each mould. Cut the chocolate into squares on put 4 squares together onto the batter in the middle and cover with a small spoon of the batter. Continue until all of the moulds are full. Put a deep baking tray onto the stove top and 1/4 fill with water, Start to heat the water while you are covering the puddings. Cover the tray well with foil and turn to low so that the puddings simmer but do not boil (water may get into them). Simmer for 20-25 minutes before opening one and pressing to test. The pudding should be firm to touch. Put the sugar in a pot with the lemon juice on a medium heat. Don't stir just keep swirling until all of the sugar is starting to dissolve. Keep watching and cook the sugar till dark golden. Great! I’m absolutely in. I don’t care about this not eating flour, sugar and butter. Bring it on. I guess, there is no way, but to try it. I hope, there is still some candied ginger in the house. That’s exactly the kind of dessert I go for. I would be glad to help with that anytime. Yum Tania! I was always so ignorant to how delicious ginger can be in desserts until I tried a friends pudding and was blown away. I can’t wait to try this version now! Silly me. I’ve never paired ginger anything with chocolate. These look wonderful, Tania! G’day! Don’t these look GORGEOUS, true! YUM…wish I could come through the screen and try one of these now too! Oh my what a combination of flavours! I’m happy to be old fashioned with you any day. No carb or sugar restrictions here! These are so perfectly matched to winter – what a gorgeous looking (and I bet tasting!) dessert. It’s 28C degrees in my flat right now at 8am, but oh, I am still so tempted by this gorgeous little pud. However, I will put aside temptation right now and file this one for cooler times! Swah recently posted..Rosewater and Pistachio Cupcakes… with a surprise inside! I always thought chocolate puddings were the best but having seen these? Ginger with a chocolate centre looks even better! 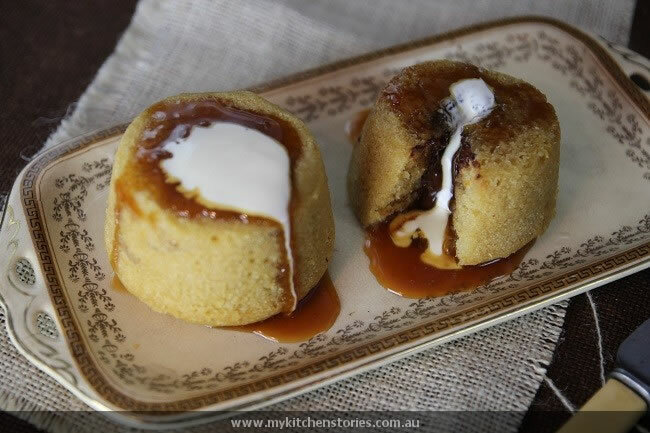 Chocolate filling in ginger pudding…wow..this is just brilliant! Puuuurrrrfect in winter but I challenge you that it would taste just as divine in summer too! 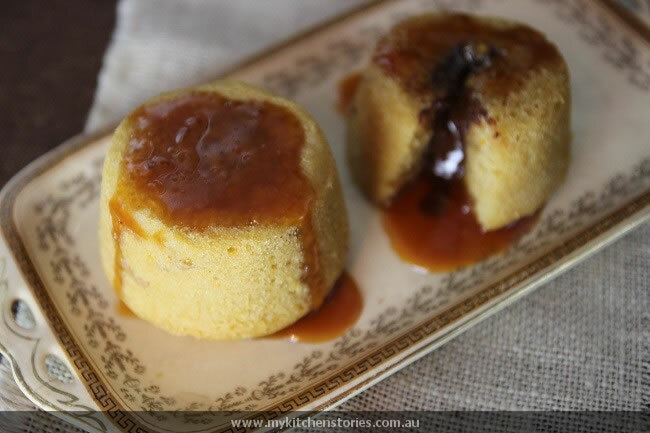 I’ve not heard of ginger lava cakes, Tania, but these sure sound and look good. One of the reasons I do so little baking is because there are few people to share them with. If I bake it, I eat it — and that’s not as good as it sounds. Perhaps things would work out better if I baked your lava cakes. I guess there’s only 1 way to find out. I audibly gasped when I read the title of this post. Brilliant recipe. 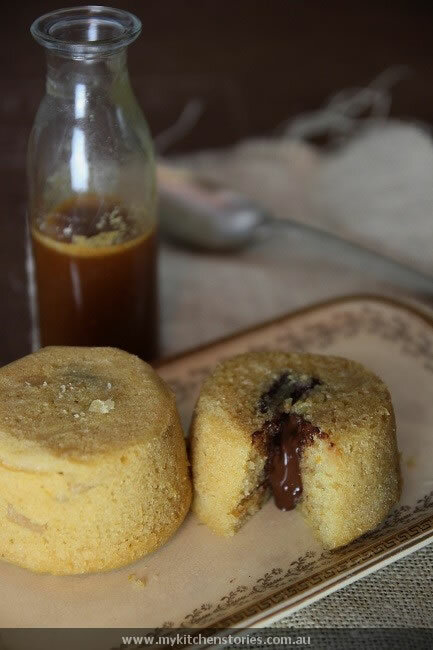 Ginger–chocolate–molten…what’s not to love? Thanks for sharing! The molten center looks awesome! I’m loving this theme! Everyone loves a little sweet surprise! I guess I’m old fashioned as well. Your dessert looks so temptingly delicious.